At All Warringah Locksmiths we provide a comprehensive portfolio of services including: replacement locks emergency service, security key systems, masterkeyed systems and restricted key systems. We also provide security door lock repairs and replacement, commercial door bolts, residential door bolts, garage door bolts, garage door locks and Safe opening. We can repair window and mailbox locks and get keys made and replaced. Lost your keys? We are just a phone call away to repair or replace lost/stolen keys. We can cut a variety of keys to suit a wide range of locks which is especially good for damaged keys. Good locks can be expensive and depending on the extent of the damage we may be able to repair your lock. Protecting very important assets is critical and you can rely on All Warringah Locksmiths for safe servicing and installation. Our new super strong keys and locks can protect your assets from theft and damage. We recommend changing keys often so you can ensure security of your property this is particular good if you just moved in! Our new high tech touch locks offer a top of the line solution for those who want ease of access and strong security. 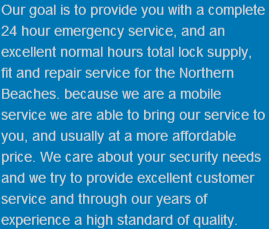 Getting a locksmith out to your business quickly is important and at All Warringah Locksmiths we understand this. At All Warringah Locksmiths we provide high quality keys, locks and other accessories at affordable prices including this trusty Whitco lockable chain winder. We work with a number of leading brands like Whitco, Lockwood and Blaxland.